Today, Chad Goller-Sojourner talked with NPR host Rachel Martin about the experience of being transracially adopted. Born in 1971, he was raised in Tacoma, Washington. It wasn’t until college, Chad says, that he underwent a “descent into blackness and out of whiteness. He describes it as a journey, giving up the privileges he claimed as the child of white parents and learning to accept his identity independent of them,” according to NPR’s website. The NPR show, called “Growing Up ‘White,’ Transracial Adoptee Learned to Be Black,” is available here. You can listen to the show, read NPR’s description, and submit a comment. Two weeks ago, NPR’s Sunday Conversation on Weekend Edition featured the white adoptive mom of 3 black preschoolers. NPR says that conversation “drew a lot of responses.” Indeed–well over 200 comments on their website, most of them criticizing, not complimenting, the show. Many people in the adoption community (including me) took to Twitter and blog posting, frustrated and disappointed by the show, especially because it did not include the real-life experience of someone most affected by transracial adoption: the adopted person. I’m glad NPR listened to the concerns, and took seriously the call to broaden the perspective on transracial adoption by not further marginalizing adult adoptees. Chad Goller-Sojourner’s experience will no doubt resonate with many transracially adapted persons. Little children grow up. Adoption is a lifetime of revisiting love and loss. As Chad reflects on the show, figuring out one’s identity is complex, and sometimes painful. We adoptive parents, and anyone involved with adoption, need to listen carefully to Chad’s insights. Chad is an award-winning solo performer, based in Seattle. According to Artist Trust, Chad’s show Riding in Cars with Black People & Other Dangerous Acts: Memoirs of a Post Honorary White Childhood “seeks to explore the dangers, complexities and occasional hilarities associated with navigating black adult maleness in America, when your only compass is eighteen years of honorary white citizenship and suburban privilege.” Read further here. 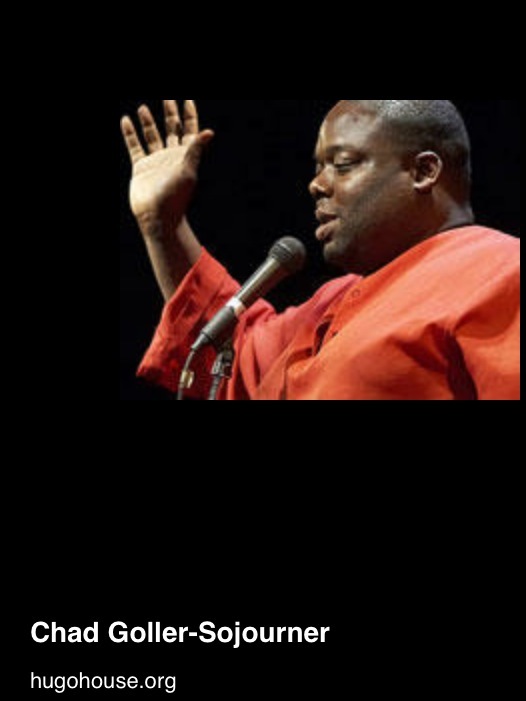 Learn more about Chad’s work: Riding in Cars With Black People, and his earlier show, Sitting in Circles With Rich White Girls: Memoirs of a Bulimic Black Boy. 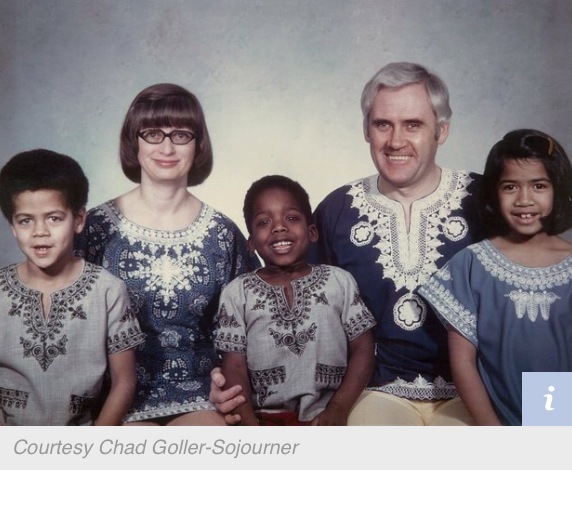 Calling NPR–KUOW: Who’s Missing from Today’s Transracial Adoption Discussion? Today’s NPR Sunday Morning Edition show (broadcast locally here in Seattle on KUOW) is about transracial adoption. The guest is Rachel Garlinghouse, the white adoptive mother of three black children, all of whom are under six years old. Rachel seems like a lovely person, has a very popular blog, wrote a book about transracial adoption, and dispenses lots of advice about transracial adoptive parenting. The headline is about the double takes the family gets. Let me assure you that’s the least of what transracial adoptees go through, yet that’s apparently the big draw to advertise the segment. So who’s missing from today’s discussion? The people most affected by the topic. While I don’t dismiss Rachel’s perspective, I am deeply disappointed that Yet Another Show about transracial adoption features Yet Another Nice White Adoptive Parent, this one whose kids are preschoolers. She lives in a predominately white area in Illinois, and has hired a black, Christian woman to be a mentor for her children. Hired. She says on her blog description of herself: “I really wish I lived on the beach. Except sand and Black hair don’t mix well.” Oh my. What do all those folks in the Caribbean do? My gentle jabs here at Rachel are nothing compared to what her children may face later, as black Americans in what remains a racist society. She clearly deeply loves her children, but she can only imagine what lies ahead for them. Look at most NPR segments on international and transracial adoption, and who are the guests? Nice white adoptive parents. And often nice white adoption agency executives and lawyers (who are often adoptive parents). NPR lost, yet again, an opportunity for listeners to hear from those most affected by transracial adoption: adult adoptees. Angela Tucker was passed over. She writes a blog called The Adopted Life. Yes, the bright, warm, perceptive African-American adult adoptee, raised in Bellingham, WA, by white parents, featured in the powerful documentary Closure (about her search and reunion with her original African-American family in Tennessee), now living in Seattle–the NPR producers decided not to have her on. Another would be Chad Goller-Sojourner, an African-American transracially adopted adult, “a storyteller, solo-performer and recipient of a distinguished Washington State Arts Commission Performing Arts Fellowship. Most recently he served as the 2013 Ohio University Glidden Visiting Professor, where his work focused on the social, political and historical dimensions of multi-identity construction and intersectionality. In 2011 he was awarded both an Artist Trust Grant and Creative Artist Residency to further develop his sophomore solo show: Riding in Cars with Black People & Other Newly Dangerous Acts: A Memoir in Vanishing Whiteness.” You can read more about Chad and his other plays and work here. In May 2013, NPR (and KUOW) did have a Sunday Conversation on adoption that included Nicole Soojung Callahan, a US adult adoptee in the Washington, DC, area, and an adoption attorney, to discuss legal issues in adoption searches. Nicole is an insightful, smart person, and as usual did a wonderful job discussing the story of her search. She had written a great piece in Slate about her search; click here to read it. The segment was not about transracial adoption, though Nicole could have talked on that subject, on today’s NPR show. You can listen to the May 2013 show here. Who are the people most impacted by transracial adoption? I’d argue it’s the adoptees, for whom transracial adoption was not a choice, for whom other people decided that transracial adoption would be best. Adoptees who do not remain children, as sweet and wonderful as they may be as preschoolers. Adoptees who grow up and can speak genuinely of their experiences with racial discrimination, of what their parents did and didn’t do successfully to prepare them for adulthood as people of color, and of what “transracial adoption” really involves. Other great people to talk about transracial adoption could be found via Lost Daughters, Gazillion Voices, and many other resources. Many have written books, just like Rachel Garlinghouse. Rachel Garlinghouse’s 3 little African-American children are all placed as open adoptions, meaning some form of ongoing contact with their first/original parents. It would have been interesting if any of the those parents were also on this show. As best I can tell, none of the 6 is included. You can link to the NPR show, and comment on it, here.